Assembled Dimensions: 88D x 35W x 54H | Weight: 500.00 lbs. - System uses a Luraco Pump with a magnetic jet head. - Jet head is surface mounted magnetically and is easily removable for sanitizing between sessions. - Includes 1 additional magnetic jet head. - Large, comfortable chair with heat and massage functions. - Tuffed seat padding provides extra comfort. - Outer chair back features two storage pockets for controls storage. - Chair swivels for easy entry/egress and has self-aligning feature to hold the chair in the proper straight forward position for treatments. - Removable back insert cushion facilitates heat and massage system service. - Adjustable oversize, reversible footrest to accommodate clients height. 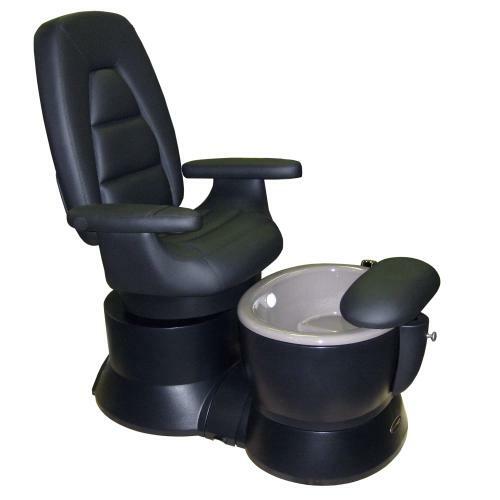 - Multi-function push button controls under the right side armrest are easy to reach for the client. -two buttons move the chair forward and back to adjust to the client’s height. -two buttons move the electric powered backrest recline mechanism to set the backrest at the most comfortable angle for the client. - Features a Belvedere exclusive cast-iron bowl with durable porcelain enamel finish available in choice of over 20 rich enamel colors. - Over flow caps made of antimicrobial engineered plastic resin resistant to bacterial growth. - Powder-coated, welded tubular steel frame provides solid support. - “Plug and play” installation requires no special plumbing or electrical connections.